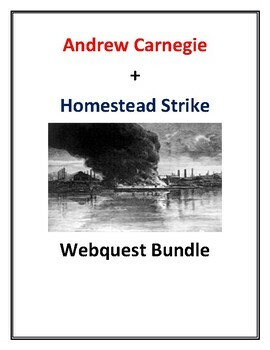 Andrew Carnegie + Homestead Strike Webquest Bundle With Keys! This two-part webquest bundle will help students learn all about connected two topics during the Industrial Revolution! ***Each webquest starts on a separate page, allowing you to pick and choose when you will use each. ***Each webquest includes an answer key! 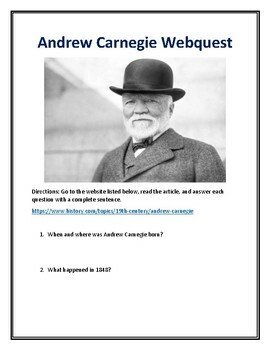 This 20 question History.com webquest will allow students to learn all about steel tycoon Andrew Carnegie! Important dates associated with this topic. Details about Carnegie's childhood and how his childhood impacted his work ethic. How Carnegie first got involved with the steel industry. The public's perception of Carnegie. 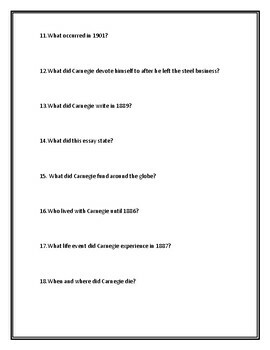 Information regarding how Carnegie became extremely wealthy and what he did with his wealth. Details about Carnegie's life after he left the steel industry. Students will love to learn all about this important figure through an independent webquest! An answer key is included for your convenience! This 15 question History.com webquest will help students learn all about the Homestead Strike! How the Homestead Strike began. Andrew Carnegie's involvement with this strike. How this strike escalated into chaos and violence. The overall impact the Homestead Strike had on workers and unions. 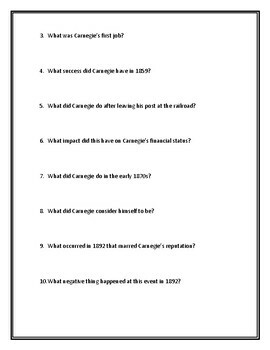 Students will enjoy learning about this historic event through an independent webquest! An answer key is included for your convenience!